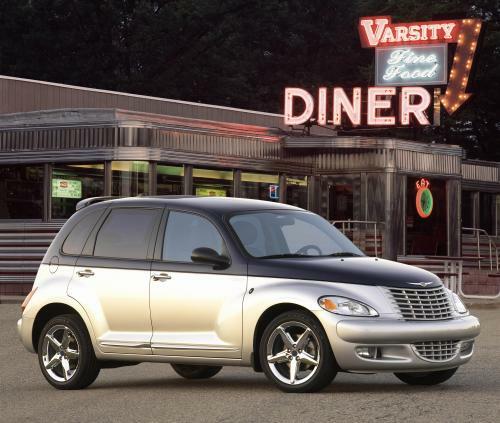 Another dream comes true with the introduction of the new 2004 Chrysler PT Dream Cruiser Series 3. Just in time for Detroit's Woodward Dream Cruise, the latest offering in the limited-production series of Chrysler PT Cruisers includes a standard 220-horsepower High Output turbo engine, unique Midnight Blue and Bright Silver two-tone paint scheme and blue-tinted glass, the latter of which are both firsts in the PT Cruiser lineup. "These combinations might seem a little flamboyant by today's standards, but they were extremely popular and helped the company sell 1.6 million vehicles in 1955, more vehicles than in any year prior to that time," said McKinnon. I still think it'd look better with the colors "flipped" - dark bottom, silver top. I have to agree with the comments posted above . Jody, thanks for that info . This is the first Dream cruiser they have made that has normal colors IMHO! I drove one at the Block Party and it is faster than mine but to be honest not a big upgrade for me!! Blue tinted glass, I wonder what the D.O.T. will have to say about that. one forsale on ebay right now, lots of pics.